We have a dedicated “Vertical” garden again this year, featuring the cattle panel trellises. 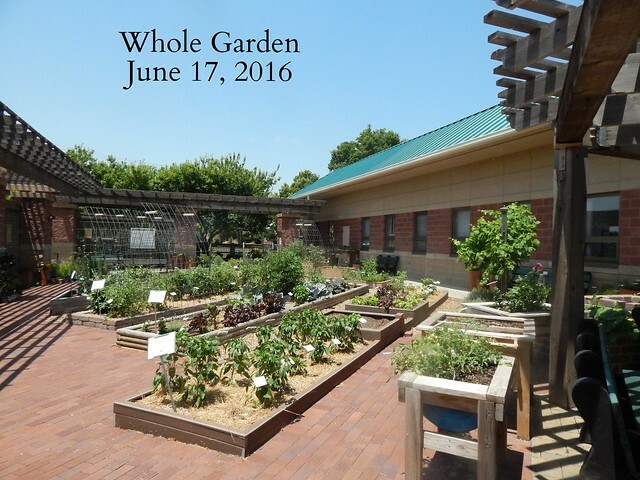 We do try to change up what we’re growing, and this year we are featuring cantaloupe, watermelon, and cucumbers. The cucumbers include a pickler, a slicer, and an English/European type. The ‘Arkansas Little Leaf’ is a pickler with smaller diameter leaves than a usual variety that is also heat and disease tolerant. 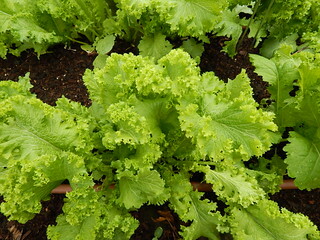 The ‘Lime Crisp’ has bright green skin rather than darker green as is usual. ‘Tyria’ is a parthenocarpic (seedless) English variety. We had another variety selected, but it cost about $1.25 per seed, and we couldn’t buy less than 50 seeds…so that was a NO. We have done cantaloupe in the past, but we have always stuck to the smaller fruited varieties. This year we have ‘Lilliput,’ which is a new personal size variety that is supposed to be very sweet. But then we chose two other varieties, ‘Maverick’ and ‘Sarah’s Choice’ that are larger. ‘Sarah’s Choice’ is a 3 pound melon, and ‘Maverick’ is a 4-5 pound melon. It will be fun to see how successful they are in the trellis system. The watermelons are also a range of sizes and characteristics. We haven’t had great success with watermelons on the trellis, but we are still going to try them again! ‘Golden Crown’ is a yellow rind, red fleshed, seeded watermelon. It is an All America Selection from several years ago. It has 5-7 lb. fruit. ‘New Queen’ is an orange fleshed, seeded watermelon that is 5-6 lbs, also an All America Selection. ‘Mini Love’ is a new variety this year that is also an All America Selection. It is red fleshed, seeded, with 7-9 lb. fruit. This variety is supposed to have 3-4′ vines but still up to 6 fruit per plant. It seems like a lot of large fruit for not much vine. I’m excited to see how it performs. As an All America Selection, it should be a consistent producer. With another week of sun, rain, and heat, the garden continues to grow quickly. Many of our vines and other warm season vegetables are finally putting on some good growth. Surprisingly, the tomatoes are still looking really good with minimal signs of disease or other problems. Many of the plants have reached full-size, although the vining crops have yet to fill the trellises. The Oriental Garden is really starting to look good. This ‘Ladyfinger’ okra didn’t germinate very well, but looking at the plants now, I’m glad that we only have 4 or 5 plants. They are starting to take over the surrounding area already! There are just a few buds starting to develop. Maybe by next week there will be some okra to show. The ‘Goddess’ banana peppers are showing off this summer. We’ve grown banana peppers many times, but this variety is by far the most productive of the ones we’ve grown recently. The three plants have been loaded with peppers. The Pollinator garden is looking great with bright colors of the milkweeds, zinnias, and sages. This garden will just continue to grow, change, and get more beautiful as the summer progresses. As I said earlier, the vines are just starting to take off. This is the Oriental garden. The left side of the trellises has beans and the luffa gourd. The right side of the trellises has cucmbers and melons. They are just starting to set fruit. Do you know what this is? It is the flower of a passionflower/passionfruit vine. I don’t know if it will actually produce fruit, but we are watching it grow and bloom in our Pollinator Garden. It is just starting to climb up the trellis. Wow, it’s hot. I don’t know about your gardens, but in our garden the plants are definitely struggling to keep up with the heat. Because we had so much rain, many of them don’t have the developed root systems to deal with so much heat and evaporation. That said, our warm season veggies are starting to grow quickly. One change that you can see is that we have mulched our peppers, tomatoes, and eggplant. We only had two bales, so the straw isn’t very thick and there are areas yet to be mulched. Straw mulch helps cool the soil and maintain even soil moisture. It helps prevent evaporation, which I’m all for during a hot spell like this! Most of our tomatoes have started to set fruit. This is ‘Tiren,’ a roma tomato. It has a really odd shape, which is kind of interesting. You can also see that one of them is starting to show signs of blossom end rot. 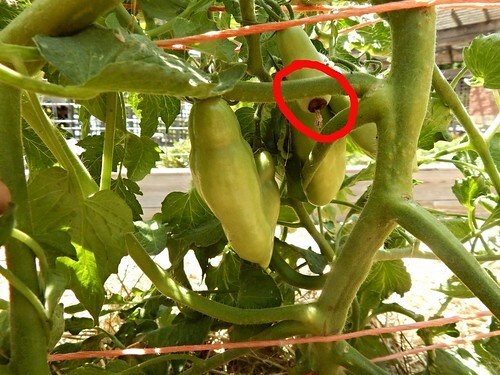 This is very common on early season roma tomatoes in particular, but we’ve also had a little trouble with the drip system on the tomato garden. We will be watching to see if any of the other varieties also develop blossom end rot. 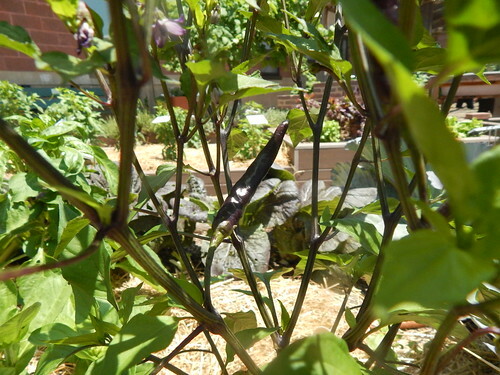 The purple cayenne pepper is also starting to set fruit. The flowers are purple, the stems are purple, and the peppers are purple. Eventually, the peppers will turn red when they reach the fully ripe stage. The ‘Islander’ bell pepper is also setting some fruit, and this one is getting large enough that it is developing some of the lavender coloration. 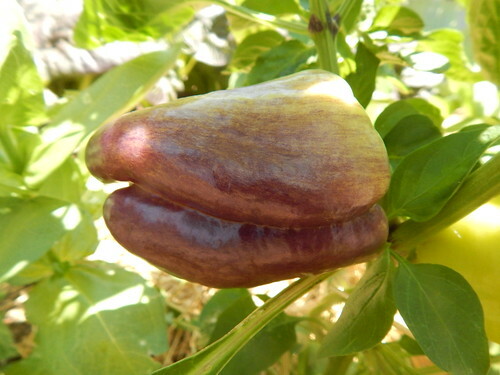 This pepper will also turn red eventually, but it is purple at what would typically be the “green” stage for a bell pepper. 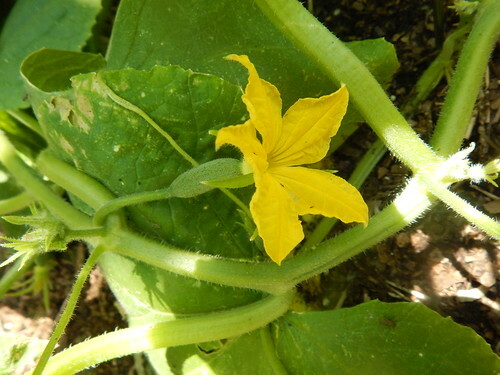 The ‘Iznik’ snack cucumber is starting to flower a bit. It has fairly small fruit and a supposedly compact plant form, so we will be watching it for productivity and how much space it takes as it grows. 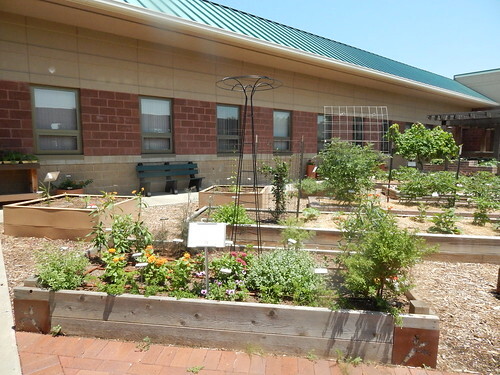 Last but not least…our semi-regular look-in at the pollinator garden. It isn’t filling in very rapidly, but we have some great flowering going on! Since we are basically done with Friday PhotoEssays for the year, I am going to switch gears a little bit and do a few more “Year in Review” posts to wrap up this year’s garden. We’ve already done the heirloom tomatoes, and today we are going to take on the Taste of India garden. Cumin: We never managed to get the seeds to germinate. I don’t know if it was them or us, but we’ll have to give in a try another time. Ajwain/Cuban Oregano: This plant started as a tiny transplant that I thought for sure was going to bite the dust. And then it turned into this sprawling monster! Needless to say, it loved the summer. It did start showing cold injury once we got down to the 40s overnight. Unfortunately, I never got around to figuring out how to cook with it, so it was an attractive plant, but not overly useful. ‘Kesar’ Red Carrots: These carrots had huge tops, and the roots were decent sized as well. They were more purple than red, although a commenter did say that the name of the carrot indicated the more purple color than what we would typically call red. Unfortunately, we got a late start with them, since the seeds didn’t germinate readily. (Again, probably more us than them.) This meant that by the time we harvested, the carrots were pretty bitter due to the heat. ‘Samurai’ Red Carrot: More red colored than the ‘Kesar,’ these carrots also suffered from summer heat bitterness. Ugh. ‘Dulhan’ Pepper: This was a round, flat pepper that started pale cream/white and turned red. It was a sweet pepper with a little kick to it. It did fine, although by later in the summer it was getting too much shade from the trellises and didn’t produce very well. 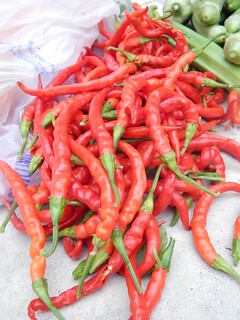 ‘Jwala’ Pepper: This hot pepper did great, as most hot peppers are prone to do in Kansas summers. ‘Sagar’ Spinach: This spinach was a little bit slower to germinate than our regular spinach varieties, and the leaves were much more tender and succulent. I think that flavor-wise it was a little stronger flavored. Maybe a little more reminiscent of mustard or kale? It was no more heat/bolt resistant than other varieties, which I was hoping for. I’m curious to see how it compares to the other spinach when it gets cold next week, but I’m not expecting it to survive like our other spinaches. 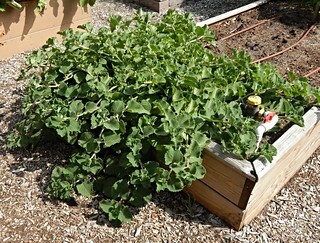 ‘Basanti’ Mustard Greens: If you like mustard greens, this was a great, fast-growing variety. We had a hard time keeping up with it in the spring. It did bolt earlier than I thought it might, but we were really tired of mustard greens by then. ‘King Cobra’ Snake Gourd: The snake gourd plant was slower to get started in the summer, but it pretty much took over the world after that. It had really cool white flowers with nice fragrance. The plant itself was relatively productive, although we weren’t harvesting frequently to help keep it producing. We never got around to trying out recipes with these gourds, so it was more ornamental than anything. ‘Tagore’ Bitter Melon: The bitter melon plant did well initially, until it got swarmed under by the snake gourd. We did get some fruit off it earlier in the season, but then it quite producing. My best guess would be that was due to the snake gourd. Or maybe it just isn’t that productive. Denise did cook a couple of these, but we decided that it was a big hassle to cook with and that zucchini were tastier than the bitter melon. ‘Poona Kheera’ Cucumber: This cucumber was quite productive in the first part of the summer and had decent flavor. It was pretty seedy, but that would be normal for this type of cucumber. Again, not much production later on, which I blame on the snake gourd. ‘Sambar’ Cucumber: Since this was the cooking cucumber that was harvested at the yellow stage rather than the green stage, the plants definitely didn’t produce as much as other cucumbers. Leaving maturing fruit on the vine usually limits additional fruit development. We got a decent harvest, but not spectacular. And they seemed to quit producing in the late summer. Dare I blame the snake gourd again? ‘Black Kabouli’ Chickpeas: The plants were attractive and the yield was okay, all things considered. We did have some caterpillar eating the peas out of the pods, which reduced the yield. Fun novelty, but not particularly productive for a small space. I still need to make up a batch of hummus from the chickpeas we harvested. 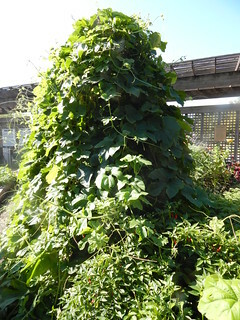 Green Cowpeas: The cowpeas went crazy over the summer. We ended up cutting them back several times. They also completely swarmed under the Curry Leaf and the Lemon Savory that were growing on the end of the bed. The yield was decent, although for the size of the plants I would have expected a little bit more. They had a couple different flushes of flowers and pods, but then quit as it got cooler in the late summer and early fall. Probably more effective as a cover crop than a yielding crop in a garden, but still fun to try. So….this garden was a bit of a story of a couple plants taking over everything else and a few other plants that did well. Nothing particularly stood out as something that we need to try again or that we really liked.